In general, after an incubation period of 1-6 days, the history suggests a severe and rapidly progressive sepsis. Recent travel in the Southwestern and Pacific Coast regions of the United States, particularly in New Mexico, Arizona, California, and Utah, should raise suspicion of a fleabite. Although imported plague is rare, similar suspicion should exist for any recent travel to endemic areas outside the United States. Fewer than 10% of patients recall a prior fleabite. A sudden increase in the incidence of severe pneumonia in previously healthy individuals should raise concern for pneumonic plague possibly deployed as a bioterrorism weapon. In general, after an incubation period of 1-6 days, the plague presents with the physical findings of severe and rapidly progressive sepsis with or without features of pneumonia. Multiple organ involvement occurs. Pneumonic plague may present only as a severe pneumonia. Inguinal bubo (60%), axillary (30%), cervical (10%), or epitrochlear (10%) (Bubo is usually no greater than 5 cm, extremely tender, erythematous, and surrounded by a boggy hemorrhagic area; patient often flexes, abducts, and externally rotates the hip near an involved inguinal node to reduce pain at the site.) Children are more likely to have a cervical or submandibular bubo. Images below show a bubo and a necrotic ulcer. 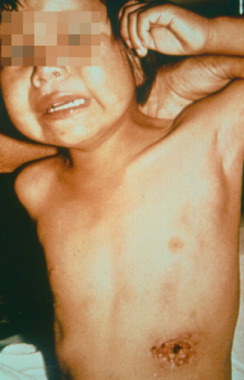 A maculopapular lesion may be found at the site of the fleabite; however, such lesions commonly are found at autopsy implying that, in the United States, the diagnosis often is not determined until it is too late. 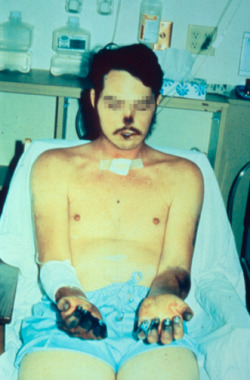 Acral cyanosis, ecchymosis (shown in the image below), petechiae, and digital gangrene are seen with Y pestis septicemia (from disseminated intravascular coagulation [DIC]). The medieval epithet "Black Death" is thought to have originated from the deeply cyanotic skin, ecchymoses, and/or acral necrosis associated with terminal septicemic and pneumonic plague. 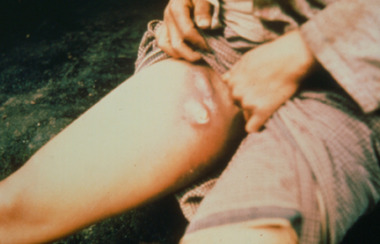 The initially rose-colored purpuric lesions most likely gave rise to the child's nursery rhyme "Ring Around the Rosy." 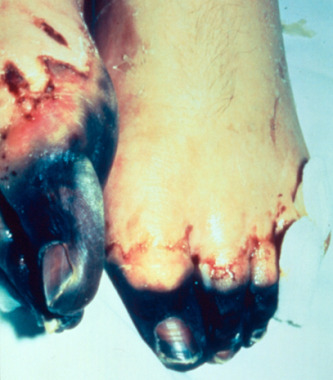 Rare cases of ecthyma gangrenosum–like lesions and carbuncles due to blood-borne Y pestis have been described. Pharyngitis culture positive for Y pestis has been seen in endemic areas in household contacts of those with bubonic plague. These patients also have associated cervical lymphadenopathy.